Ventana Wildlife Society performs a variety of ecological services throughout central California for our clients and collaborators. Our ecological services include consultation, conservation planning, research, monitoring, and wildlife management. All of these services are designed to conserve native wildlife and their habitats while addressing specific needs of our partners. We have expertise with federal and state-listed bird species, California Bird Species of Special Concern, and many other wildlife species. 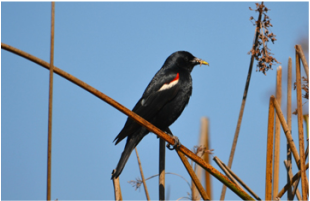 In 2013, Ventana Wildlife Society assisted Santa Lucia Conservancy with their research and monitoring study of Tricolored Blackbirds, a California Bird Species of Special Concern experiencing considerable population declines. We monitored breeding colonies at Santa Lucia Preserve and Fort Ord, and tracked foraging and post-breeding dispersal for 19 radio-tagged Tricolored Blackbirds. By tracking Tricolored Blackbirds, even once by airplane, we learned more about the connectivity of regional populations, the importance of breeding and foraging habitat on the preserve, and the post-breeding habitat these birds need. 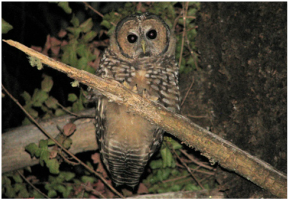 ​In 2006 and 2009, Ventana Wildlife Society conducted Spotted Owl surveys through a contract with the U.S. Forest Service at 250 locations in Los Padres National Forest and other nearby sites within the Santa Lucia Mountain Range. We recorded a minimum of 112 Spotted Owls in 2006 and a minimum of 99 at the same survey locations in 2009. Our surveys helped evaluate the persistence and distribution of this California Bird Species of Special Concern, amid recent habitat changes associated with sudden oak death and a 2008 wildfire. Starting in 2010, Ventana Wildlife Society contracted with California Department of Parks and Recreation to monitor and manage avian predators of Snowy Plovers and Least Terns, two listed species at Oceano Dunes State Vehicular Recreation Area. Our specialist identified individual avian predators posing an unacceptable threat to plovers and terns, and when needed, trapped those predators and transported them to appropriate habitat away from the park. Correcting an imbalanced predator-prey relationship, even in the short-term, can give Snowy Plovers and Least Terns a fighting chance for a long-term recovery on our coastline. In 1992-2010, we operated a bird banding lab along the Big Sur River, which contains important riparian habitat for migrating songbirds. Widely known as the Big Sur Ornithology Lab, this station allowed us to determine population trends for a variety of species while demonstrating the importance of local riparian habitat. We have also conducted long-term surveys over the last 25 years at another important riparian corridor, the Carmel River. Stake, M. M. 2012. Trends in Vagrant Capture Rates at a Coastal California Banding Station (1993-2010). Bird Populations 11:14-21. Stake, M. M. 2011. Trends in Capture Rates for Summer, Winter, and Permanent Resident Songbirds at Big Sur, California. North American Bird Bander 36:149-155. Stake, M. M., and K. Sorenson. 2011. 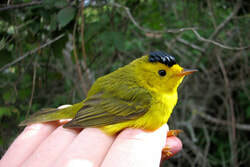 Trends in Riparian Songbirds Banded at Big Sur, Central California Coast. Western Birds 42:85-95. Ventana Wildlife Society. 2009. Evaluating Diverter Effectiveness in Reducing Avian Collisions With Distribution Lines at San Luis National Wildlife Refuge Complex, Merced County, California. California Energy Commission, Public Interest Energy Research (PIER) Program. CEC‐500‐2009‐078. Graham, A., and N. Thorngate. 2005. Nuttall's White-crowned Sparrow (Zonotrichia leucophrys nuttalli). In The Coastal Scrub and Chaparral Bird Conservation Plan: A Strategy for Protecting and Managing Coastal Scrub and Chaparral Habitats and Associated Birds in California. California Partners in Flight. Thibodeau, M. D. 1999. Analysis of Mist Net Tier Capture Frequencies in a Coastal California Riparian Habitat. North American Bird Bander 24(1). Ritchie, K. 2000. Carmel River Avian Monitoring Program (2000): Carmel River Mouth, Rancho San Carlos, Rancho Canada, All Saints, Red Rock, DeDampierre. Ventana Wildlife Society Technical Report #002 to Monterey Peninsula Water Management District, Big Sur, CA. Tenney, C. R. 2000. Analysis of avian guild species diversity in the Carmel River riparian corridor (2000). Ventana Wildlife Society Technical Report #003 to Monterey Peninsula Water Management District, Big Sur, CA. 004 Scott, J. W., J. D. Frey, and S. L. Hamilton. 2001. East Molera Grassland Avian Monitoring Program. Ventana Wildlife Society Technical Report #004 to California Department of Parks and Recreation, Big Sur, CA. 005 Tenney, C. R. 2001. Analysis of avian guild species diversity in the Carmel River riparian corridor (2001). Ventana Wildlife Society Technical Report #005 to Monterey Peninsula Water Management District, Big Sur, CA. 006 Emmons, G. J., S. L. Hamilton, and J. Scott. 2002. Carmel River Lagoon Avian Monitoring Project Report (1999-2002). Ventana Wildlife Society Technical Report #006 to California Department of Parks and Recreations, Big Sur, CA. 007 Hamilton, S. L., J. D. Frey, J. W. Scott, and J. J. Meyer. 2002. East Molera Grassland Avian Monitoring Program (2001-2002). Ventana Wildlife Society Technical Report #007 to the California Department of Parks and Recreation, Big Sur, CA. 008 Hamilton, S. L., J. F. Matusik, M. Mayrhofer, J. J. Meyer, and J. W. Scott. 2002. Central coast Monarch Butterfly project report (winter 2001-02). Ventana Wildlife Society Technical Report #002 to Helen Johnson, Big Sur, CA. 009 Hamilton, S. L., J. W. Scott, and G. J. Emmons. 2002. Carmel River Lagoon Avian Monitoring Program (1999-2002). Ventana Wildlife Society Technical Report #009 to the California Department of Parks and Recreation, Big Sur, CA. 010 Scott, J. W., S. L. Hamilton, and J. F. Matusik. 2002. Carmel River Avian Monitoring Program (2002): Carmel River Mouth, Rancho San Carlos, All Saints, Red Rock. Ventana Wildlife Society Technical Report #010 to Monterey Peninsula Water Management District, Big Sur, CA. 011 Tenney, C. R. 2002. Analysis of avian guild species diversity in the Carmel River riparian corridor (2002). Ventana Wildlife Society Technical Report #011 to Monterey Peninsula Water Management District, Big Sur, CA. 012 Hamilton, S. L., J. W. Scott, and J. D. Frey. 2003. East Molera Grassland Avian Monitoring Program (2001-2003). Ventana Wildlife Society Technical Report #012 to the California Department of Parks and Recreation, Big Sur, CA. 013 Hamilton, S. L., J. W. Scott, and J. L. Griffiths. 2003. Micro-climate parameters associated with three overwintering Monarch Butterfly habitats in central California, study sites include Andrew Molera State Park (stands A and B) and Point Lobos State Reserve, (Winter 2002-2003). Ventana Wildlife Society Technical Report #013 to the California Department of Parks and Recreation, Big Sur, CA. 014 Scott J. W., S. L. Stock, and J. L. Griffiths. 2003. Carmel River Lagoon Avian Monitoring Program (1999-2003). Ventana Wildlife Society Technical Report #014 to the California Department of Parks and Recreation, Big Sur, CA. 015 Scott, J. W., S. L. Stock, and J. L. Griffiths. 2003. Sensitive species report: results from point count surveys at Camp Roberts National Guard training site. Ventana Wildlife Society Technical Report #015 to California Army National Guard, Camp Roberts, Big Sur, CA. 016 Stock, S. L., Scott, J. W., and J. L. Griffiths. 2003. Carmel River Avian Monitoring Program: All Saints, Red Rock, Rancho San Carlos, Carmel River Mouth. Ventana Wildlife Society Technical Report #016 to Monterey Peninsula Water Management District, Big Sur, CA. 017 Foster, S., and K. Sorenson. 2004. National Oceanic and Atmospheric Administration Bay Watershed Education and Training Final Progress Report. Ventana Wildlife Society Technical Report #017 to National Oceanic and Atmospheric Administration, Salinas, CA. 018 Griffiths, J. L., E. Miller, and N. Thorngate. 2004. Camp Roberts Avian Monitoring Program: Monitoring Avian Productivity and Survivorship. Ventana Wildlife Society Technical Report #018 to California Army National Guard, Camp Roberts, Big Sur, CA. 019 Griffiths, J. L., E. Miller, and N. Thorngate. 2004. Riparian habitat evaluation at Camp Roberts National Guard training site. Ventana Wildlife Society Technical Report #019 to California Army National Guard, Camp Roberts, Big Sur, CA. 020 Griffiths, J. L., E. Miller, and S. L. Stock. 2004. Sensitive species report: results from avian point count surveys at Camp Roberts National Guard training site. Ventana Wildlife Society Technical Report #020 to California Army National Guard, Camp Roberts, Big Sur, CA. 021 Stock, S. L. 2004. Analysis of avian guild species diversity in the Carmel River riparian corridor. Ventana Wildlife Society Technical Report #021 to Monterey Peninsula Water Management District, Big Sur, CA. 022 Stock, S. L., and J. L. Griffiths. 2004. Microclimate parameters associated with three overwintering monarch butterfly habitats in central California: a two year study, study sites include Andrew Molera State Park (stands A and B) and Point Lobos State Reserve, (Winter 2003-04). Ventana Wildlife Society Technical Report #022 to the California Department of Parks and Recreation, Big Sur, CA. 023 Stock, S. L., N. Thorngate, and J. D. Frey. 2004. East Molera Grassland Avian Monitoring Program (2001-2004). Ventana Wildlife Society Technical Report #023 to the California Department of Parks and Recreation, Big Sur, CA. 024 Tenney, C. R., and S. L. Stock. 2004. Analysis of avian guild species diversity in the Carmel River riparian corridor (2003). Ventana Wildlife Society Technical Report #024 to Monterey Peninsula Water Management District, Big Sur, CA. 026 Thorngate, N., and S. L. Stock. 2004. Carmel River Avian Monitoring Program (2004): All Saints, Red Rock, Rancho San Carlos, Carmel River Mouth (mature and restored). Ventana Wildlife Society Technical Report #026 to Monterey Peninsula Water Management District, Big Sur, CA. 027 Porte, A., and K. Sorenson. 2005. National Oceanic and Atmospheric Administration Bay Watershed Education and Training Final Report. Ventana Wildlife Society Technical Report #027 to National Oceanic and Atmospheric Administration, Salinas, CA. 028 Griffiths, J. L. 2005. Analysis of avian guild species diversity in the Carmel River riparian corridor. Ventana Wildlife Society Technical Report #028 to Monterey Peninsula Water Management District, Big Sur, CA. 029 Sorenson, K. 2005. Nancy Buck Ransom Foundation Final Report. Ventana Wildlife Society Technical Report #029 to Nancy Buck Ransom Foundation, Salinas, CA. 031 Thorngate, N. 2005. Monitoring Avian Diversity and Abundance in the Odello West Restoration Site, Carmel, California. Ventana Wildlife Society Technical Report #031 for the California Department of Parks and Recreation, Big Sur, CA. 032 Thorngate, N. 2005. Power structure risk assessment and avian protection plan for Camp Roberts Army National Guard training site. Ventana Wildlife Society Technical Report #032 prepared for California Army National Guard, Camp Roberts, Salinas, CA. 033 Thorngate, N., and B. Tryon. 2005. Carmel River Lagoon Avian Monitoring Program Report. Ventana Wildlife Society Technical Report #033 to the California Department of Parks and Recreation, Big Sur, CA. 034 Thorngate, N., J. Griffiths, and S. Stock. 2005. Sensitive species report: Brown-headed Cowbird trapping on recolonization by Least Bell’s Vireo and abundance and diversity of other riparian-associated birds at Camp Roberts California Army National Guard Training site. Ventana Wildlife Society Technical Report #034 to California Army National Guard, Camp Roberts, Big Sur, CA. 035 Griffiths, J. L. 2005. Micro-climate parameters associated with three overwintering Monarch Butterfly habitats in central California: a three year study. Ventana Wildlife Society Technical Report #035 to the California Department of Parks and Recreation, Big Sur, CA. 036 Griffiths, J. 2006. Songbird and monarch butterfly conservation on the California central coast. Ventana Wildlife Society Technical Report #036 to Dean Witter Foundation. Big Sur, CA. 037 Griffiths, J. L. 2006. Micro-climate parameters associated with three overwintering Monarch Butterfly habitats in central California: a four year study. Ventana Wildlife Society Technical Report #037 to the California Department of Parks and Recreation, Big Sur, CA. 039 Thorngate, N. 2006. Diversity of neotropical migratory landbirds in Central Coastal California. Ventana Wildlife Society Technical Report #039 for USFWS Neotropical Migratory Bird Conservation Act, Agreement No. CA-N211, Big Sur, CA. 040 Thorngate, N., and J. L. Griffiths. 2006. Camp Roberts Avian Monitoring Program: Monitoring Avian Abundance, Productivity and Survivorship. Ventana Wildlife Society Technical Report #040 to California Army National Guard, Camp Roberts, Big Sur, CA. 041 Thorngate, N., and J. L. Griffiths. 2006. Sensitive species report: Monitoring potential recolonization by Least Bell’s Vireo and population trends of riparian-associated birds at Camp Roberts California Army National Guard Training site. Ventana Wildlife Society Technical Report #041 to California Army National Guard, Camp Roberts, Big Sur, CA. 042 Thorngate, N., J. Scullen, J. Griffiths, and J. D. Frey. 2006. East Molera Grassland Avian Monitoring Report (2001-2006). Ventana Wildlife Society Technical Report #042 to the California Department of Parks and Recreation, Big Sur, CA. 043 Shihadeh, K.R. 2006. Habitat relationships and California Spotted Owls: Big Sur Ecoregion, Northern Los Padres National Forest. Ventana Wildlife Society Technical Report #043 to U.S. Forest Service, Salinas, CA. 045 Thorngate, N., J. Scullen, and J. Olson. 2006. Avian community dynamics in the lower Carmel River watershed, 1992-2006. Ventana Wildlife Society Technical Report #045 to Monterey Peninsula Water Management District, Big Sur, CA. 046 Thorngate, N., J. Griffiths, and J. Scullen. 2007. Microclimate parameters associated with overwintering monarch butterfly habitats in two State Parks on the central coast of California. Ventana Wildlife Society Technical Report #046 to the California Department of Parks and Recreation, Big Sur, CA. 047 Thorngate, N. 2007. Nesting Bird Surveys: Julia Pfeiffer Burns/McWay Canyon. Ventana Wildlife Society Technical Report #047 to the California Department of Parks and Recreation, Ventana Wildlife Society, Salinas, CA. 050 Thorngate, N. 2007. Camp Roberts Avian Monitoring Program: Monitoring Avian Abundance, Productivity and Survivorship. Ventana Wildlife Society Technical Report #050 to California Army National Guard, Camp Roberts, Ventana Wildlife Society, Salinas, CA. 051 Thorngate, N. 2007. Preliminary avian survey of blue oak woodlands at the CA ARNG Camp Roberts Training Facility. Ventana Wildlife Society Technical Report #051 to California Army National Guard, Camp Roberts, Ventana Wildlife Society, Salinas, CA. 052 Thorngate, N. 2007. Sensitive Species Report: Monitoring potential recolonization by Least Bell’s Vireo and population trends of riparian-associated songbirds at Camp Roberts California Army National Guard Training Site. Ventana Wildlife Society Technical Report #052 to California Army National Guard, Camp Roberts, Ventana Wildlife Society, Salinas, CA. 053 Scullen, J. and N. Thorngate. 2007. Carmel River Lagoon Avian Monitoring Program Report. Ventana Wildlife Society Technical Report #053 to California Department of Parks and Recreation, Ventana Wildlife Society, Salinas, CA. 054 Thorngate N. and J. Scullen. 2007. Carmel River Avian Monitoring Program. Ventana Wildlife Society Technical Report #054 to the Monterey Peninsula Water Management District, Ventana Wildlife Society, Salinas, CA. 055 Shihadeh, K. and N. Thorngate. 2007. Avian diversity and riparian focal species abundance on the Lower Carmel River, Monterey County, Ca. Ventana Wildlife Society Technical Report #055 to the Monterey Peninsula Water Management District, Ventana Wildlife Society, Salinas, CA. 056 Shihadeh, K. 2007. Creamery Meadow post-restoration vegetation inventory. Ventana Wildlife Society Technical Report #056 to the California Department of Parks and Recreation, Ventana Wildlife Society, Salinas, CA. 060 Frey, D., S. L. Stock, S. Stevens, J. W. Scott, and J. L. Griffiths. 2003. Monarch butterfly population dynamics in western North America – emphasis on Monterey and San Luis Obispo Counties: winter 2002-2003 report. Technical Report #060, Ventana Wildlife Society, Salinas, CA, and California Polytechnic State University, San Luis Obispo, CA. 062 Ventana Wildlife Society. 2008. Carmel River avian monitoring program: monitoring avian productivity and survivorship (MAPS): summer 2008. Technical Report #062 submitted to Monterey Peninsula Water Management District. Ventana Wildlife Society, Salinas, CA. 063 Ventana Wildlife Society. 2008. Carmel River avian monitoring program: Carmel River riparian corridor point count census. Technical Report #063 submitted to Monterey Peninsula Water Management District. Ventana Wildlife Society, Salinas, CA. 064 Ventana Wildlife Society. 2009. Update to the avian protection plan for Camp Roberts Army National Guard Training Site. Technical Report #064 submitted to California Army National Guard, Camp Roberts. Ventana Wildlife Society, Salinas, CA. 065 Ventana Wildlife Society. 2009. Evaluating diverter effectiveness in reducing avian collisions with distribution lines at San Luis National Wildlife Refuge Complex, Merced County, California. Technical Report #065 submitted to California Energy Commission. Ventana Wildlife Society, Salinas, CA. 066 Ventana Wildlife Society. 2009. Results of point count surveys conducted along the Carmel River, Monterey County, California in 2009 – figures and tables. Technical Report #066 submitted to Monterey Peninsula Water Management District. Ventana Wildlife Society, Salinas, CA. 067 Ventana Wildlife Society. 2009. California Spotted Owl surveys following a wildfire in the northern Los Padres National Forest. Technical Report #067 submitted to Los Padres National Forest, Santa Maria, CA. Ventana Wildlife Society, Salinas, CA. 068 Ventana Wildlife Society. 2009. Avian monitoring at Santa Lucia Preserve – 2009 results. Technical Report #068 submitted to Santa Lucia Conservancy, Carmel, CA. Ventana Wildlife Society, Salinas, CA. 069 Ventana Wildlife Society. 2010. Results of point count surveys conducted along the Carmel River, Monterey County, California in 2010 – tables and figures. Technical Report #069 submitted to Monterey Peninsula Water Management District, Monterey, CA. Ventana Wildlife Society, Salinas, CA. 070 Ventana Wildlife Society. 2010. Avian monitoring at Santa Lucia Preserve – 2010 results. Technical Report #070 submitted to Santa Lucia Conservancy, Carmel, CA. Ventana Wildlife Society, Salinas, CA. 071 Sorenson, K., and P. Young. 2010. Avian predator management project: trapping and relocation of problem avian predators at Oceano Dunes State Vehicular Recreation Area in 2010. Technical Report #071 submitted to California Department of Parks and Recreation, Oceano Dunes State Vehicular Recreation Area. Ventana Wildlife Society, Salinas, CA. 072 Ventana Wildlife Society. 2010. Pre-construction bird and bat monitoring at two proposed wind energy sites in Soledad, California. Technical Report #072 submitted to City of Soledad. Ventana Wildlife Society, Salinas, CA. 073 Sorenson, K., and P. Young. 2011. Avian predator management project: trapping and relocation of problem avian predators at Oceano Dunes State Vehicular Recreation Area in 2011. Technical Report #073 submitted to California Department of Parks and Recreation, Oceano Dunes State Vehicular Recreation Area. Ventana Wildlife Society, Salinas, CA. 074 Sorenson, K., and P. Young. 2012. Avian predator management project: trapping and relocation of problem avian predators at Oceano Dunes State Vehicular Recreation Area in 2012. Technical Report #074 submitted to California Department of Parks and Recreation, Oceano Dunes State Vehicular Recreation Area. Ventana Wildlife Society, Salinas, CA. 075 Stake, M. 2012. Results of point count surveys conducted along the Carmel River, Monterey County, California in 2012. Technical Report #075 submitted to Big Sur Land Trust. Ventana Wildlife Society, Salinas, CA. 076 Ventana Wildlife Society. 2013. Avian protection plan for Camp Roberts, California Army National Guard Training Site, 2013 update. Technical Report #076 submitted to California Army National Guard. Ventana Wildlife Society, Salinas, CA. 077 Ventana Wildlife Society. 2013. Survey of nesting seabirds and Peregrine Falcons at Point Sur State Historic Park - spring 2013. Technical Report #077 submitted to Central Coast Lighthouse Keepers and California Department of Parks and Recreation. Ventana Wildlife Society, Salinas, CA. 078 Ventana Wildlife Society. 2013. Pre-construction bird and bat monitoring in 2012-2013 at a proposed wind energy site in Gonzales, California. Technical Report #078 submitted to Herbert Meyer Land Trust. Ventana Wildlife Society, Salinas, CA. 079 Young, P. 2013. Avian predator management project: trapping and relocation of problem avian predators at Oceano Dunes State Vehicular Recreation Area in 2013. Technical Report #079 submitted to California Department of Parks and Recreation, Oceano Dunes State Vehicular Recreation Area. Ventana Wildlife Society, Salinas, CA. 080 Stake, M. 2013. Avian predator management for the protection of California Least Terns and Western snowy Plovers at Oceano Dunes State Vehicular Recreation Area in 2011-2013. Technical Report #080 submitted to California Department of Parks and Recreation, Oceano Dunes State Vehicular Recreation Area. Ventana Wildlife Society, Salinas, CA. 082 Ventana Wildlife Society. 2014. Avian predator management project: trapping and relocation of problem avian predators at Oceano Dunes State Vehicular Recreation Area in 2014. Technical Report #082 submitted to California Department of Parks and Recreation, Oceano Dunes State Vehicular Recreation Area. Ventana Wildlife Society, Salinas, CA. 083 Ventana Wildlife Society. 2015. California Condor locations and flight patterns near two proposed wind turbine sites at Scheid Vineyards and Misionero in Monterey County, California. Technical Report #083 submitted to Foundation Windpower. Ventana Wildlife Society, Salinas, CA. 084 Stake, M. 2015. Results of point count surveys conducted along the Carmel River, Monterey County, California in 2015. Technical Report #084 submitted to Monterey Peninsula Water Management District. Ventana Wildlife Society, Salinas, CA. 086 Young, P. 2015. Avian predator management project: trapping and relocation of problem avian predators at Oceano Dunes State Vehicular Recreation Area in 2015. Technical Report #086 submitted to California Department of Parks and Recreation, Oceano Dunes State Vehicular Recreation Area. Ventana Wildlife Society, Salinas, CA. 088 Stake, M. 2015. 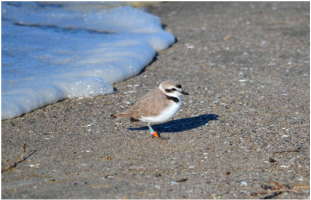 Avian predator management for the protection of California Least Terns and Western Snowy Plovers at Oceano Dunes State Vehicular Recreation Area in 2014-2015. Technical Report #088 submitted to California Department of Parks and Recreation, Oceano Dunes State Vehicular Recreation Area. Ventana Wildlife Society, Salinas, CA.